Been waiting for today for along time, a big announcement for a few athletes on the shore. Folks across the shore have been anticpating today. 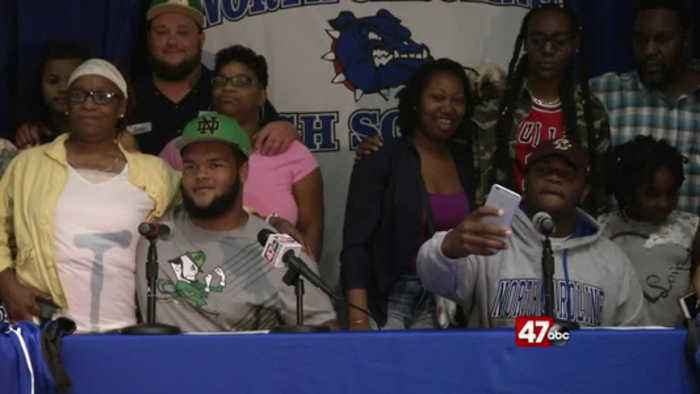 Jamion franklin and david baily jr of north caroline football announced where they'll be heading for their college ball. And if you caught our noon show, you were just as excited as i was, as travon miles went up to rigley to catch the announcements live. The big guy, junior defensive tackle jamion franklin will join the irish at notre dame. Running back david bailey junior is shipping up to boston college to play for the eagles. Franklin joined the bulldogs this year after playing at gilman prep. After a monster, first team all-conference season, 20 plus offers flooded in. He considered virginia tech, uva, and syracuse among others. But hes going to play like a champion in south bend. Bailey junior, also a bayside first team all conference selection. Had more than six offers--syracuse among them. Bailey junior chose boston college. Both fellas still have another year in the bayside and will look to terrorize the conference once again... but for now, they're just happy that all their hard work has made this dream come true.. It definitely shows a testament to my hard work, thankful for my coaches for pushing me everyday, knowing what i was capable of. And telling me that the potential that i have is even greater than what i believe in. Every offseason my coaches pushing me, on and off the field in school, to be a student athlete, my parents, im just truly blessed to put on a boston college hat because i know i fit in perfect there..
Congradulations to both bulldogs on their commitments. We turn now to some more unfortunate news. A 73 year old male employee of the delmar speedway sustained severe injuries after an incident at the track today. The state fire marchal's investigation concluded that the injury was caused by a flash fire, started by an electrical fuel pump used to transfer racing fuel.the incident was reported 11:35. The victim was transported to bayview medical center in baltimore. Authoities say the victim suffered second and third degree burns to about 20 percent of his body. And moving on to baseball. The orioles, in action tonight against the pittsburg pirates. And things started out on a high note for the o's. First inning, ivan nova deals and seth smith sends it over the wall in center, 1-0 orioles early! Runners on the corners in the second inning, andrew mccutchen sends one to right fild, david freese scores and we've got a tie game. John jaso's turn-- he drives one to the gap in right center field, josh bell tags up and scores on the double. Here's freese, taking kevin gausman to the street, a solo shot for him. But the orioles pulled out the 6-5 win. Normally, phils fans, someone in a braves jersey isnt something to smile about. But here's an exception, prior to tonight's brave-phils matchup in atlanta, one-armed luke terry throw out the first pitch at sun trust park. Terry is a catcher for his middle school baseball team in tennessee, but he looks pretty comfortable out on the mound. Howie kendrick hammers the jaime garcia pitch deep to lef field, it's gone..
A solo homerun for kendrick and its tied 1-1. Odubel herrera smacks the ball toward the right field corner ...cesar hernandezhas no trouble scoring. The phillies, four straight now! They win that's it for sports, your final forecast is just ahead. Keep it right here -- you're watching 47 abc!